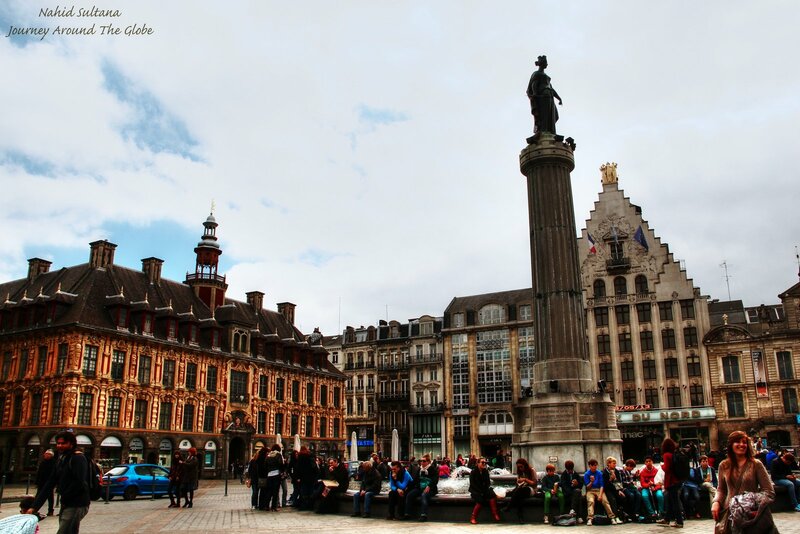 LILLE, FRANCE: Lille is a buzzing city which is waiting to be discovered by tourists yet. It makes a nice day trip if you are visiting Brussels or Brugges in Belgium. Lille is one of the largest cities in France with lots of Flemish influences, may be for being a bordering city with Belgium. Old town of this city is where local crowds gather to hang out and enjoy the atmosphere. Closest parking we found here was right at Place de General-de-Gaulle. You just walk up and voila, you are right in the middle of the main square. TIME of TRAVEL: My older sister and her family were visiting Europe in May 2013. It was their first time in this continent. We picked Lille because it’s only little more than an hour drive from our little town in Belgium and could easily make a day-trip and come back home before the kids were tired. They were going to go to Paris anyways the following week, just wanted to show them a smaller French town nearby. The weather was great and many festivals were going on every street of Lille that day. EATING and SHOPPING: Restaurant or cafes are everywhere in the city center, especially in Place du Theatre. This is where we had lunch in front of the Bourse or the Chamber of Commerce building. You can see many quick and fast food type places while walking towards Vieux Lille. Do try some French bakeries and pastries. For shopping, Rue de la Monnaie had many options from small local stores to big brand names. PLACES WE’VE VISITED: The main city center is very compact and can be covered on foot. We spent only few hours here and just walked around the old part and visited some old churches and main landmarks. 1) PLACE de GENERAL-de-GAULLE: The square is also known as Grand Place. This is the main square of the town with a big fountain in the middle with a statue known as Column of the Goddess from 1843. Many beautiful historic buildings are lined up on all sides of the square. One of the important buildings is a Flemish-style which is the headquarters of local newspaper La Voix du Nord. 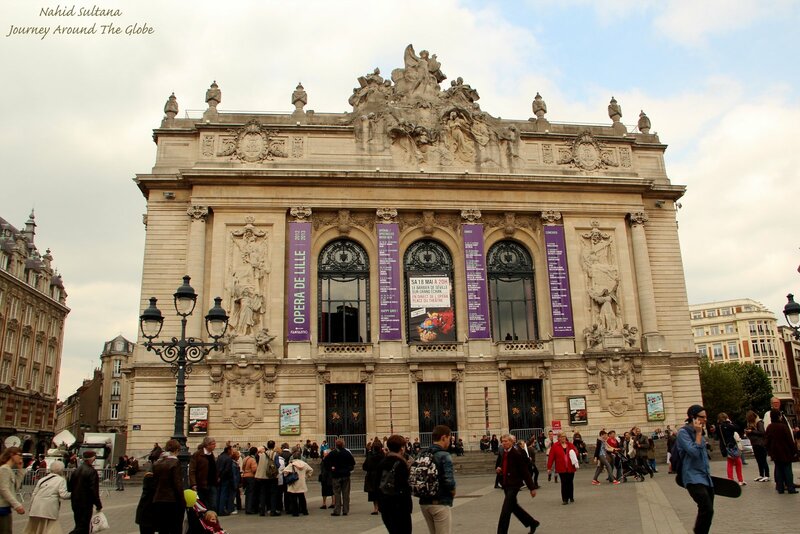 2) PLACE du THEATRE: This is a lively place with to stop and take a breath. 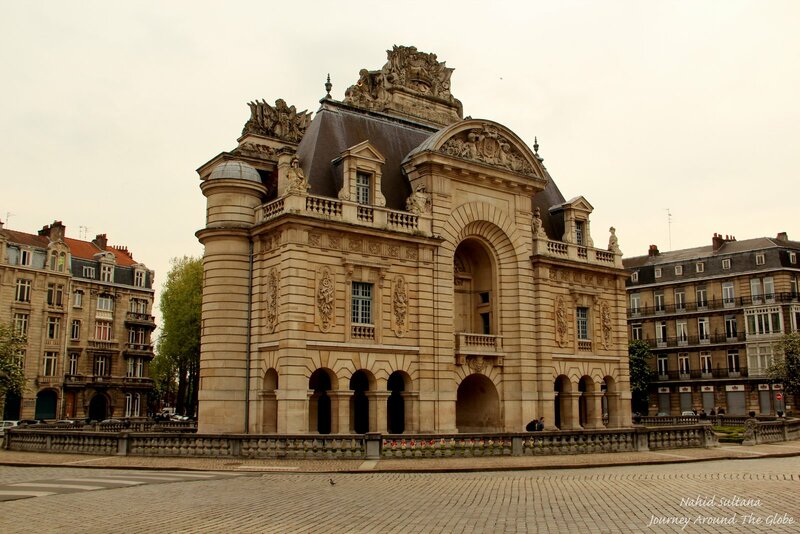 Located beside Place de General-de-Gaulle, the square houses two beautiful and historic buildings: The Opera and the Chamber of Commerce. Both of the buildings are from 1920s. These buildings are supposed to look very nice at night when all the lights are on, but too bad we didn’t stay that long! 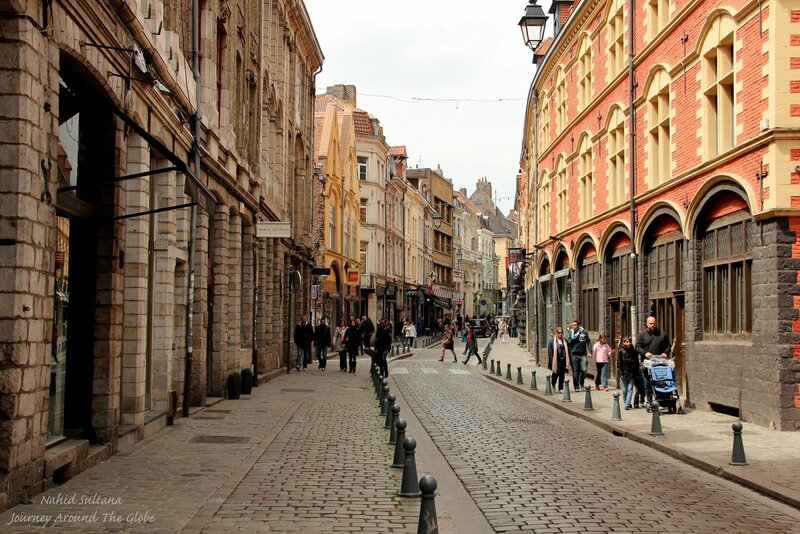 3) VIEUX LILLE: This is the old quarter of the city and nice place to take a stroll. Loved walking on the cobble-stone street of Rue de la Monnaie while enjoying the view of old houses and designer stores. Some museums are also located on Rue de la Monnaie. 4) CATHEDRALE NOTRE DAME de la TREILLE: This is an old cathedral and went through many renovations and changes over the years. Outside it has that old and wise look but inside it is rather a very modern cathedral. 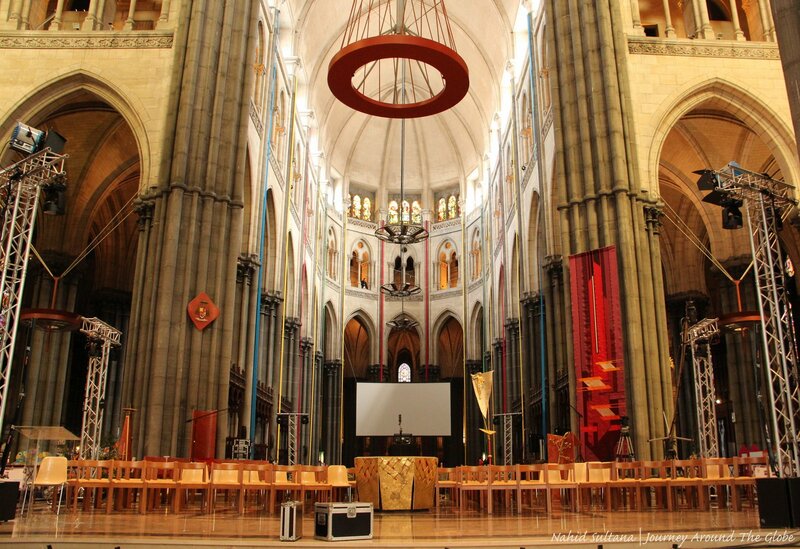 Very grand but contemporary altar and some big colorful windows are worth looking. There was an art exhibition going on behind its main altar and a live band of youngsters was singing outside in front of the cathedral during our visit. It’s free to enter and is situated in Viuex Lille. Companille or the Bell Tower of this cathedral is very old compared to the cathedral itself. There was a big fair or festival going on when we were there. Live music, food stalls, kids play area, and many other things were going on around the cathedral that day. 5) EGLISE SAINT MAURICE: Not sure when it was built, but it looked like a very old Gothic church not too far from city center. It was a big church with some beautiful stained-glass windows and really large old religious paintings. 6) HOTEL d’VILLE: We walked about 15 minutes from Place du Theatre to go see Hotel d’Ville or the city hall of Lille. It’s a big orange building with a clock tower at one side and is something worth a look. Walk few step across the street and Porte de Paris is there with a nice small garden surrounding this old gate from 1692. Fabulous! I’m hoping to get to France in the coming year, and Lille just may have to be on the itinerary!